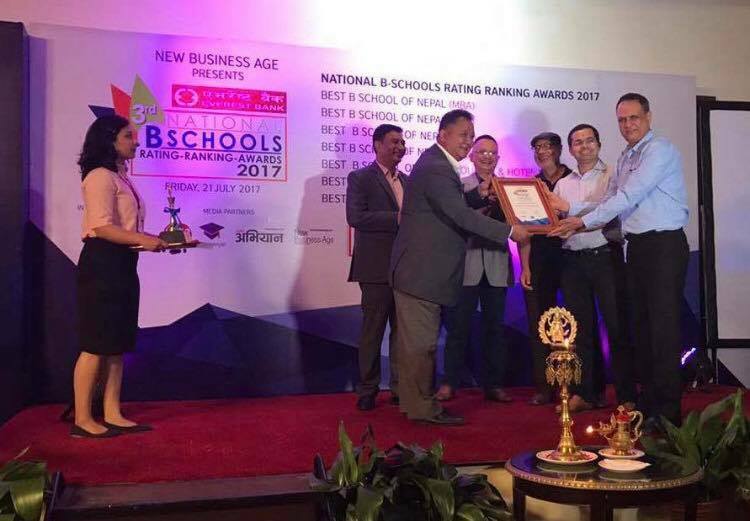 Out of 129 colleges offering Bachelor of Business Administration program with affiliation from either National University (Tribhuvan University, Pokhara University, Kathmandu University, or Purbanchal University), three colleges have been awarded as “Best B Schools of Nepal-BBA category” in the 3rd National B Schools Rating-Ranking Awards 2017 held in Hotel Annapurna, Durbarmarg, Kathmandu on 21 July. Kathmandu College of Management, which has been offering BBA with affiliation from SAIM University, has been awarded as “Best BBA College”, whereas Ace Institute of Management became the first runner up. South Asian Institute of Management (SAIM) stood 2nd runner up among BBA Colleges of Nepal. Padmakanya Multiple Campus got the award of "Best B School of Nepal from Public College"
National Business Schools Rating-Ranking Award is a flagship event of New Business Age Pvt Limited; publisher of New Business Age Magazine and Arthik Abhiyan National Daily. National Business Schools Award 2017 is a 3rd episode of this flagship event, and edusanjal was working as Educational Media Partner of this Rating/Ranking Award. Dr Rajesh Kaji Shrestha, President of Nepal Chamber of Commerce, DIG Dr. Rajib Subba and Vice President of FNCCI Umesh Lal Shrestha awarded Medal and award certificate to the winner.